Armed with Professor Goswamy’s wonderful new book, I thought it might be useful to take a brief look at a small selection of narrative paintings from the Indian sub-continent. In doing so, I acknowledge his guidance in reading those which he covers in his book. Sadly, as with so many of these manuscripts, the whole has been split up and different folios sold on, dispersing what remains around the globe. Many pages seem to have been lost: of the 1400 paintings believed to have been in the original 14 volumes, the location of only about 100 paintings is known at present. Goswamy tells us that this painting comes from a few about a young prince, Nur-ud-dahr. One inscription tells of a demon throwing this prince into the sea, from which the Prophet Elias rescued him to an island. This tale can be further reconstructed. Among the prince’s admirers was an ‘infidel’ girl who was told by a demon that the demon had kidnapped the prince one night, and had thrown him into the sea. The girl reported this to Umar, but the ‘crisis’ Prophet Ilyas (or Elias, or Elijah) had intervened and helped the prince to shore and safety. The painting, commonly attributed to Mir Sayyid Ali and Miskin, but probably the work of Basawan, according to John Seyller, is exquisite. 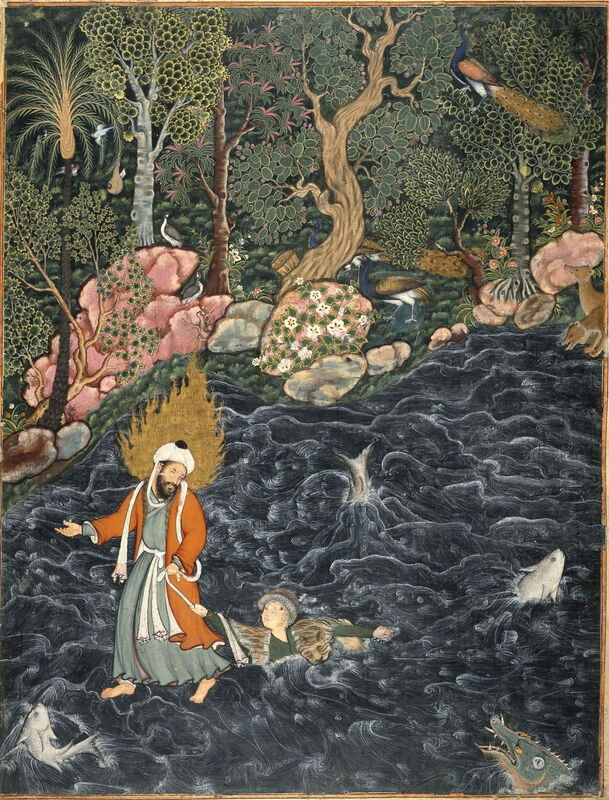 The Prophet is shown, his head distinctively surrounded by gold flames, walking on the waves and leading the prince to safety, towing him along by his scarf. The prince reaches up for the scarf with his right hand, a tiger-skin wrap around him. Facial expressions are relatively neutral, although the prince appears to be smiling with relief. Body language is clear, the Prophet leading to the shore with his right hand, and looking back at the prince. The whole of the rest of the painting sets this in turbulent waters, with large fish and an alligator nearby. The safe haven ashore is shown in wonderful and lush detail, with peacocks and the rich foliage of trees. 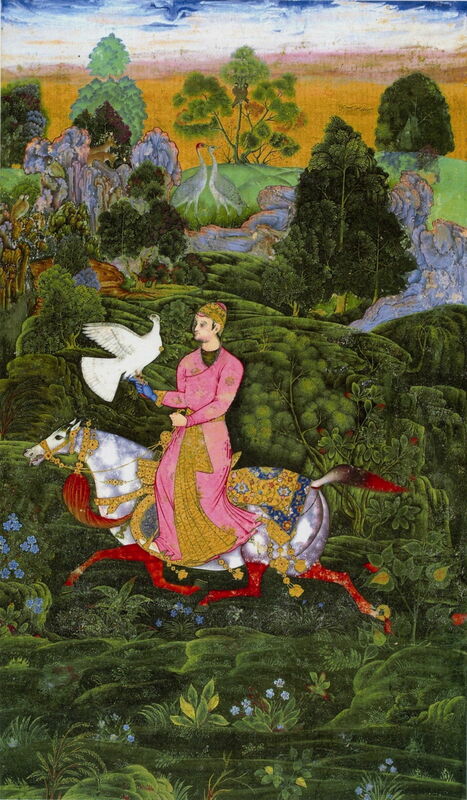 This painting comes from an album now in Saint Petersburg, and shows “one of the most gifted of the Sultans of the Deccani Kingdoms, Ibrahim Adil Shah.” Although more of a narrative portrait, showing its subject when he was not quite twenty years old, on a hawking expedition, it depicts action. Ibrahim Adil Shah is shown on horseback, his hawk on his right hand as his horse gallops through a landscape of extraordinary beauty. Goswamy identifies the wildlife as including jackals, pheasants, and saras cranes. The Mahabharata is one of the two major epics of ancient India, and probably originates from the eighth or ninth centuries BCE. The Bhagavata Purana is one of the eighteen Maha (Great) Puranic texts of Hinduism, and most probably dates from the eighth to the tenth century CE. Stories about the Pandava brothers form part of the central theme of the Mahabharata, and appear sporadically in the Bhagavata Purana too. There was a longstanding rivalry between the Kauravas and the Pandavas, known as the Kurukshetra War, although they were cousins. At one stage, the Pandavas had to leave Hastinapura and move to the city of Varanavartha/Varnavata. The Kauravas had a palace built there of highly inflammable materials, particularly lacquer (Lac), and planned to set fire to it in the night when the brothers were asleep in it. Fortunately the Pandava brothers were warned to beware of the perils of fire, and dug a tunnel to provide themselves with a means of escape. One very dark and windy night, one of the Pandava brothers decided that he would pre-empt events. He gathered the brothers and their mother, and as they were fleeing through the tunnel, set the palace on fire himself. He did not realise that a woman and her five drunken sons were still in the house, and they perished. 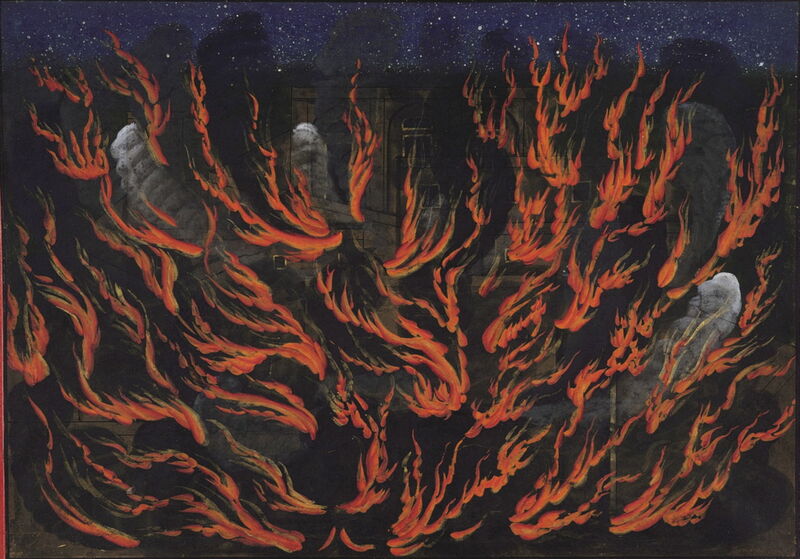 The painting shows the entire palace in flames, those being fanned by the strong wind. Grey spirals of smoke are rising from the building too, and vague details of the structure can be seen in places. The dark starry night sky forms a contrasting background. More central to the later books of the Bhagavata Purana are accounts of the life of Krishna. This episode concerns a great battle which raged between Krishna and the demon-king Naraka. Here, mounted on the sun-bird Garuda, Krishna storms Naraka’s citadel. Eventually Krishna overcomes the demon and beheads him, and is then honoured by the Earth Goddess, mother of the slain Naraka. This detail from a splendid double-page spread (which is shown complete in Goswamy’s book, p. 264) shows the blue-skinned representation of Krishna mounted on Garuda in several places. 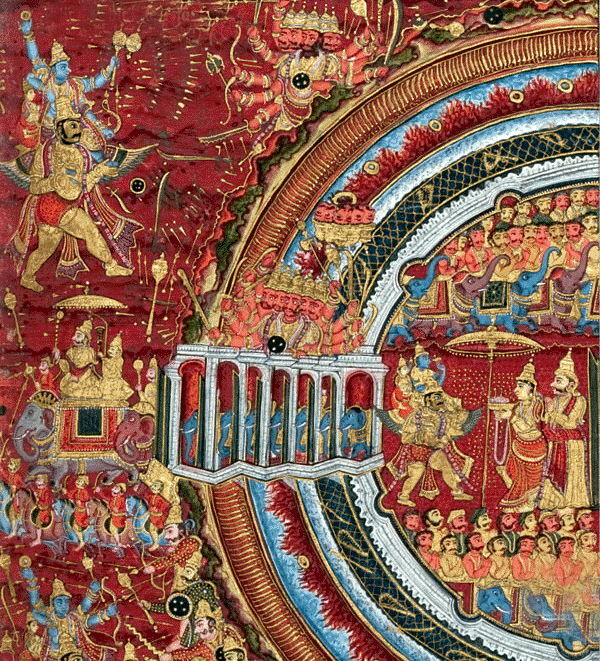 This illustrates a narrative technique which is not peculiar to Indian painting, but which died out after the Renaissance in Europe. The citadel is shown on a circular island, surrounded by a moat and other protection, which forms no barrier to Krishna and Garuda. The Ramayana is the other major epic of ancient India, and its earliest manuscripts date from the eleventh century CE, and possibly (most recently discovered) from the sixth century CE. Hanuman is a vanara of the kingdom of Kishkindha. Trisiras is the three-headed son of Tvashta, created by Tvashta to dethrone Indra. 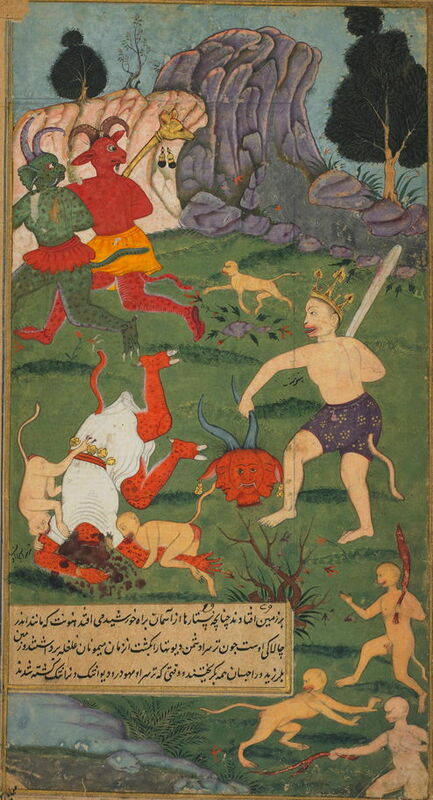 Although in other versions, Indra kills Trisiras, here it is Hanuman who cuts the triple heads off. This painting shows Hanuman, his sword still in his right hand, holding the triple head of Trisiras with his left hand. Attendants are gnawing Trisiras’ arms off. Shakuntala was the wife of Dushyanta and mother of Emperor Bharata. Her story appears in the Mahabharata, and has been retold by others and in several plays. As is usual with legends, there are many variants, and I show here two relatively recent oil paintings by Raja Ravi Varma (1848–1906) which depict events in the story. 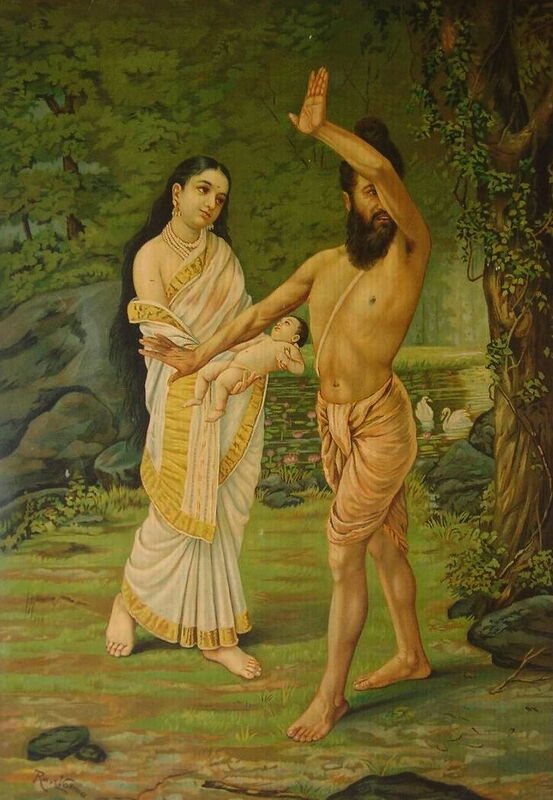 This shows Shakuntala’s father, Vishwamitra, refusing to accept her from her mother, Menaka, soon after birth. Although there is good use made of facial expressions, most prominent is the body language in the form of arm and hand gestures (mudrā) which are formalised in dance and the theatre. Raja Ravi Varma (1848–1906), Shakuntala looking back to glimpse Dushyanta (date not known), media not known, dimensions not known, location not known. Wikimedia Commons. This shows the traditional opening episode in the central legend, in which Shakuntala is walking through the forest, when she looks back. King Dushyanta has been travelling through the same forest with his army, and was pursuing a wounded male deer. Shakuntala and Dushyanta see one another and fall in love, and get married. Raja Ravi Varma follows convention in his use of facial expression, body language, and the pictorial cues and clues. My final painting, again in oils by Raja Ravi Varma, shows the legend of Urvashi and Pururavas. Urvashi is an Apsara or nymph, a celestial maiden in Indra’s court, and the most beautiful of all the Apsaras. She became the wife of King Pururavas. They met when Urvashi was returning to heaven after completing an earthly task, and was abducted by a demon. Pururavas saw this, gave chase in his chariot, and freed Urvashi. 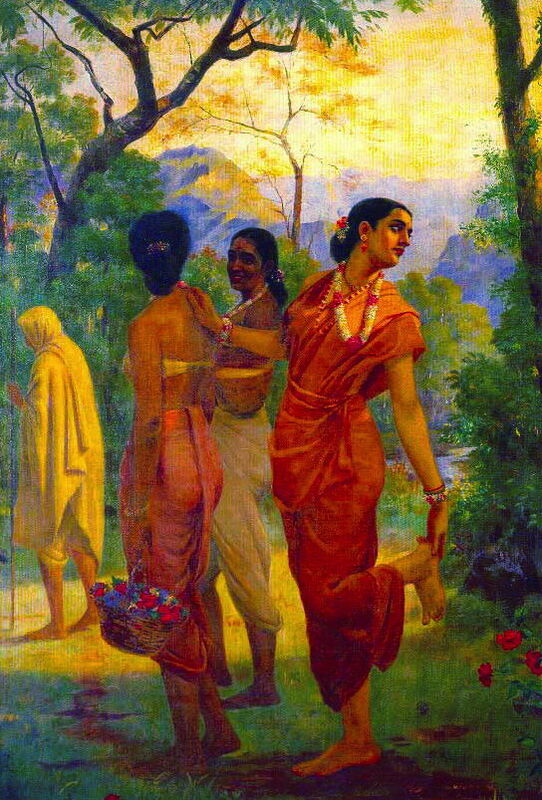 Raja Ravi Varma does not use facial expression much, but tells his narrative mainly using body language. My main reason for including this painting here is its relaxed use of perspective: in comparison with a European painting of similar age, it does not conform to a geometrically ‘correct’ perspective projection. Nevertheless, it does not look out of kilter, and does possess depth. The most difficult question to answer in most of these examples is whether the paintings that we see now were intended to illustrate the text which they accompanied, or were to be read as standalone works. The fact that history has fragmented their original texts to the point where you cannot any longer read them as integrals indicates that – whatever the original intent – they do work well as standalone paintings. The narrative techniques shown in them are generally in accordance with European paintings. Two significant differences are the use of multiple images of the same people within a single pictorial frame, as shown above, and the more formal language of gesture shared with other Indian arts. I doubt whether any of the earlier Indian painters had any knowledge of Alberti’s principles for narrative painting, but they appear to have developed their own equivalents. Narrative painting employs a more universal language than written or spoken narrative. Goswamy BN (2016) The Spirit of Indian Painting. Close Encounters with 101 Great Works 1100-1900, Thames & Hudson. ISBN 978 0 500 23950 6. Posted in General, Painting and tagged Bhagavata Purana, Hamzanama, India, narrative, painting, Ramayana, Shakuntala. Bookmark the permalink.